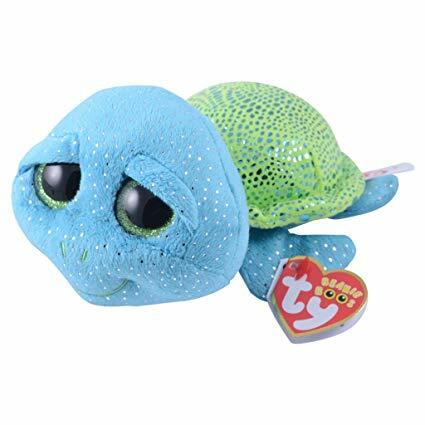 Cara is a blue sea turtle covered in flecks of silver with large, glittery green button eyes and a green embroidered mouth. She has a bright green shell with shiny green dots all over it. Her eyelids are partly closed to give her a sleepy expression. Cara was released in May 2017. Her Birthday is on 1st March. Cara is a SeaWorld exclusive Beanie Boo and 5% of profits got to the SeaWorld & Busch Gardens Conservation Fund. There are two versions of Cara. This 6″ Beanie Boo and a tiny key clip.